Protecting combustible surfaces from the intense heat of a fire and from any sparks or fuel that may fall out, a hearth is necessary - but it needn't be boring. Luckily we have a large selection of stone fireplace hearths available in many different materials, aswell as a wide choice of floor plates for stoves including stone, glass and steel hearth plates. Finally we have a selection of hearth tiles ranging from natural stone slate, granite, sandstone and travertine to ceramic and porcelain. A hearth or floor plate is necessary to protect combustible surfaces from the heat produced by stoves, fires or cookers, not to mention the sparks or embers these are apt to produce. We have a wide selection of stone fireplace hearths suitable for use with traditional fireplaces which are available in many different materials in several different finishes which can be made to measure if required. 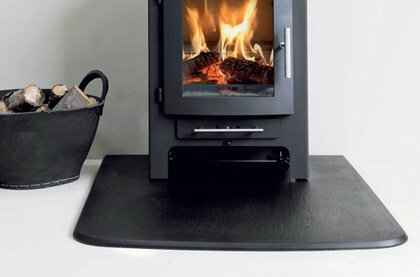 We also offer a wide choice of floor plates for stoves including stone, glass and steel hearth plates. Finally we have a selection of hearth tiles ranging from natural stone slate, granite, sandstone and travertine to ceramic and porcelain. 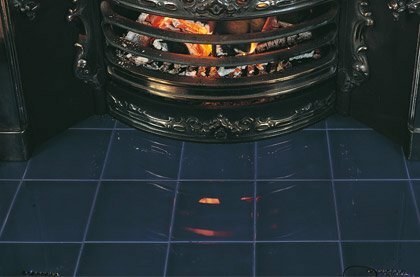 Whatever your requirement we have the hearth or floor plate available for you. The recent proliferation of new materials available for hearths and has redefined what a hearth means. A typical constructional hearth needs to be 225mm total thickness including a concrete base and decorative top. With the introduction of the 100°C regulation a new definition of hearth was introduced, the superficial hearth. 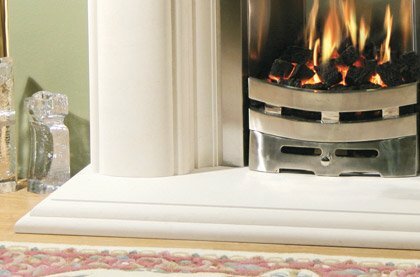 This maintains that stoves projecting a hearth temperature of less than 100°C can be placed onto a combustible floor with a non-combustible material between them with a minimum thickness of 12mm, effectively setting the stove free from the fireplace and allowing you to place it almost anywhere in a room provided it projects less than 100C downwards, and a 12mm superficial hearth exists between the stove and a combustible floor. This gave birth to the glass floor plate. Previously, if you have a wooden floor and looking to place a stove on top of it, you would have had to cut the floor, ensure the base beneath it was thick enough to comply with the 225mm constructional hearth regulation and place a piece of granite or slate down on top. 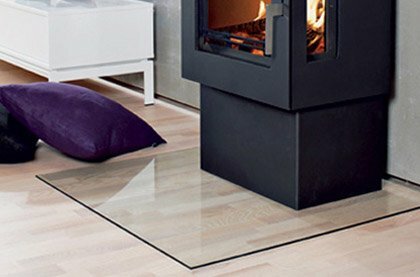 Nowadays you can now leave your wooden floor as it is and simply place a glass floor plate on top of your floor and install your stove on top of the glass. Toughened safety glass is designed to withstand temperatures of 100°C these floor plates and can be cut into many different shapes for various different installations. These floor plates can come clear, black, tinted or painted in any RAL colour to match your stove and your rooms décor. The superficial hearth regulation also helped to clear up what you can do if you have a non-combustible material. If you have a stone or tiled floor down where you plan to place your stove then technically you already have a non-combustible material beneath the stove, thus negating the need for one. However building regulations also state that a hearth should be a clear demarcation of the heating area around a fireplace, fire or stove and so simply placing on top of this would not conform. Instead a way around this would be to use a steel floor plate. At around 1-2mm thick these plates won't provide a trip hazard, offers a visual guide to the hearth area, and clearly denotes a visual demarcation of the fireplace, stove heating area in compliance with regulations. We also offer a wide range of natural stone hearths, floor plates and tiles all suitable for various different types of fireplaces, stoves, fires and cookers in all fuels. Available in a choice of granite, limestone, marble, slate and sandstone our fireplace hearths and stove floor plates make a great feature and attractive addition. Tiles can be used on the wall as well as on the floor, allowing you to line your chamber with matching or contrasting natural stone, ceramic or porcelain tiles all of which have been tested for use with heat. Since the introduction of our natural stone hearths in September 2010 we have seen demand grow and grow for different hearths and back panels. You can now easily navigate to your desired style, material and product from selecting one of our subcategories below. Also due to the revision of the building regulations in October 2010 with regards to 6mm glass hearths, there are now many more options available in selecting the perfect hearth to suit your new wood, multifuel gas or electric fires. Read this blog post to better understand hearth regulations.